The LED display is a large 45mm/1.75″ unit with super-bright LEDs and is easily daylight visible. This can be controlled via a microcontroller – with Arduino examples included here. This kit is available here for £10 per digit or £24 for a three digit displayhere for £10 per digit or £24 for a three digit display. Here at Renewable Energy Innovation we have been asked to provide large visible displays, mainly to show power and energy. These are generally run form 12V DC supplies. In fact we have been asked to do it so many times, that I thought I would design a relatively simple LED display unit which can be wired together to create large numerical displays. So here it is. The kit is available from us, via the links here. Or here are full instructions for you to build your own. This shows three digits wired together. We are now selling our kits as The Curious Electric Company. This kit is available here. A single board (1 digit) is £10 (including p&p within the UK) or three boards (3 digits) are available for £24 (including p&p within the UK). A GITHUB repository of the design files is linked here. This board is a relatively simple design. Each of the 7 segments of the LED is controlled by one bit of a shift register. The decimal point is also controlled by the shift register. This means each board is controlled via an 8 bit binary number. The decimal point is a special cas as it only contains one LED, hence must have a different current limit. An additioanl NPN transistor is used along with a 1k current limiting resistor to control the decimal point. If you have more than one board in series (they are designed to fit together to make large numerical displays), then you need to clock in all the data to control every part of the display. For example – if we have three digits then we must clock in three 8-bit digital numbers and then set the LATCH high. This will then control all three digits. Check out the instructions and the exmple code for more information. The kit includes the following parts: (As noted: you will also need an Arduino or other micro-controller board). The code for this project was written using the Arduino bootloader and IDE. (Note: It was written on version 1.02 of the IDE and is untested on other versions). LED 7 segment display example code for Arduino. The code has numerous comments and is based upon ShiftOut code from the Arduino reference website. This is a fully open-source project. The PCB and schematic for this project were drawn using the open-source KiCAD electronics design package. Here are the full KiCAD design files for this project, if you would like to make your own or use the ideas here. Also, the Gerber files for the PCB are available here. Hope all is well with you and keep up the good work! Yep – this could definitely be used with the Paspberry Pi. It should just be a matter of using 3 of the digital GPIO on the RPi, potentially with something like WiringPi (http://wiringpi.com/). I might have a quick go at wiring that up as it might be useful to folk. Quoting Guest: Looks good Matt! 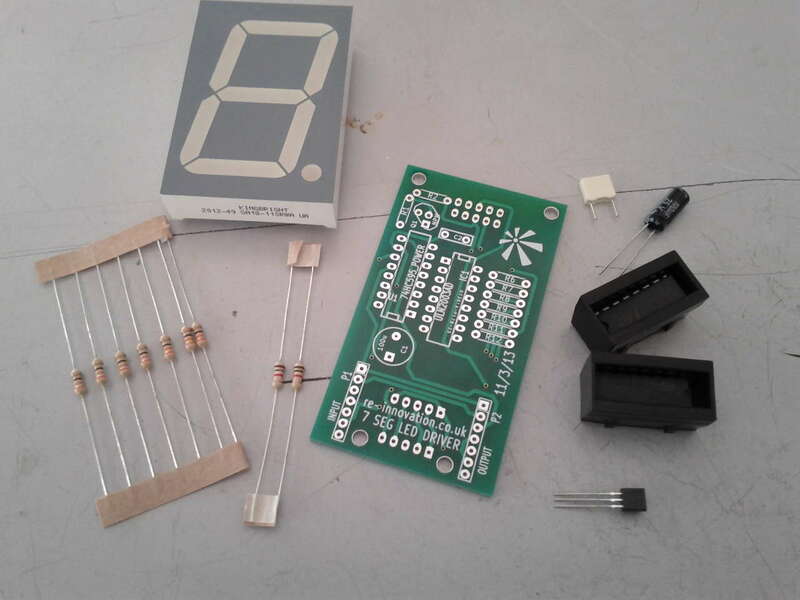 Great board – I would like to make a 4-digit clock with these, but haven’t the microcontroller skills to do it myself. Do you know of any ready-made clock driver? Quoting Guest: Great board – I would like to make a 4-digit clock with these, but haven’t the microcontroller skills to do it myself. Do you know of any ready-made clock driver? Hi Richard, I am afraid I dont know of any ready-made clock unit that would work ‘out of the box’ with this display – you would need a real time clock module to give you a timestamp and a microcontroller (I generally use the Arduino bootloader) to read the real time clock and display the time on the display. 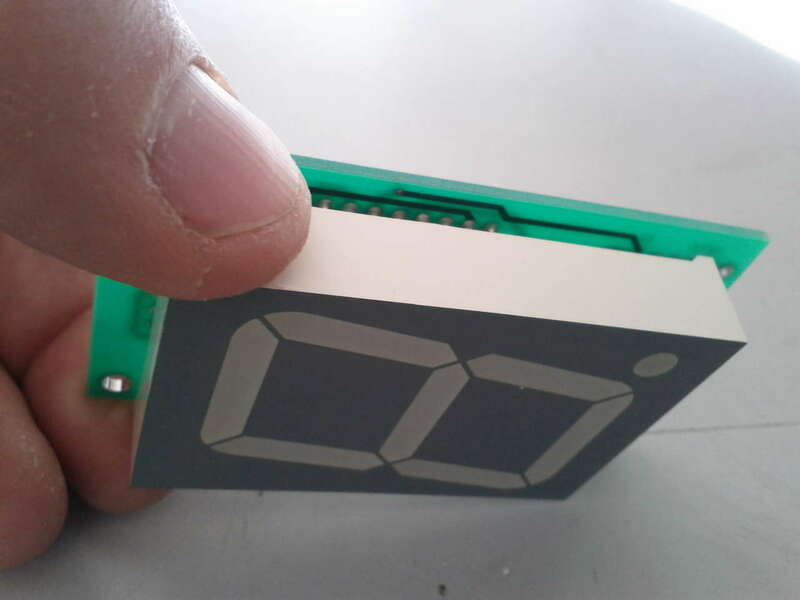 A number of companies sell a real time clock module. Loads of places sell an Arduino/microcontroller module. The issue is obviously programming them. I see the Dataduino (http://www.re-innovation.co.uk/web12/index.php/en/projects/data-acquisition-unit) which could do this job as it has both a real time clock and microcontroller (the SD card stuff would not be needed). If I get a spare moment I could look into writing code to run the 7-segment display as a clock. Hi Matt, is it possible to link 9 units together. Quoting Theo: Hi Matt, is it possible to link 9 units together. Yep – you can easily put 9 units in a row ans they would all be controlled by just three digital lines. You would clock in the data to all 9 units and thn set the latch line and the data would be isplayed. This can be done very fast so numbers can be upated regularly. Check out SerialOut function in Arduino IDE. Let me know if you are interested – I can sort out a better price for 9 units. Thank you for info and discount. I would like 9 units. Could you also please tell me what the power consumption of single unit is? Hi thank you so much. Do you also have the common cathod driver board? Does this board also support the 2.3″ seven segment displays as there are other holes that are wider than the one that you are using? 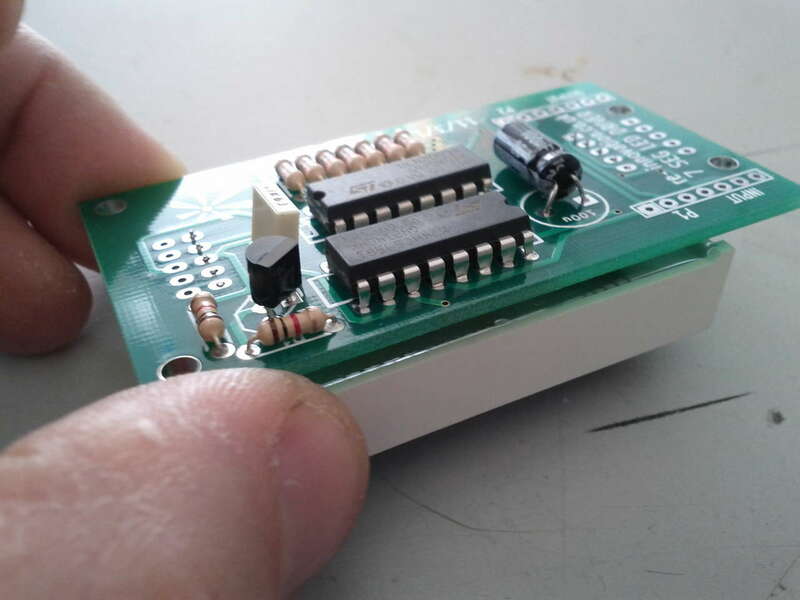 I am afraid that, while the 7 segment LED board has pins to connect to the larger 2.3″ LED units (designed for Kingbright SA23-12EWA), it only works for common annode connection. So this board would not work for common cathode displays.